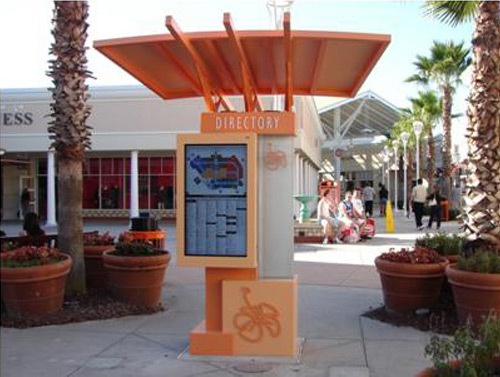 As a manufacturing specialist with a focus on the retail industry, Spencer Fabrications leveraged its custom fabrication expertise in the construction of this kiosk directory. After collaborating with the designer, a variety of materials were selected that would deliver the required aesthetics and durability. As construction began, aluminum sheets and tube were sheared and cut to length, along with the polycarbonate panels. The frame was welded, aluminum and polycarbonate panels were formed, and decorative features were laser cut. Finally, the components were assembled into the finished product and lettering and design elements were seamlessly incorporated to complete the directory. The unit was installed with stainless steel hardware. Spencer Fabrications has fabricated a number of custom designed directories such as this for various retail customers. 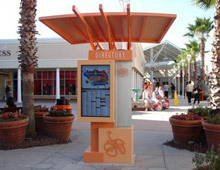 Additional information for this custom fabricated kiosk is presented in the table below. You can also contact us directly to learn more about our custom fabrication and construction capabilities. Product Description Custom Directory for a retail outlet.